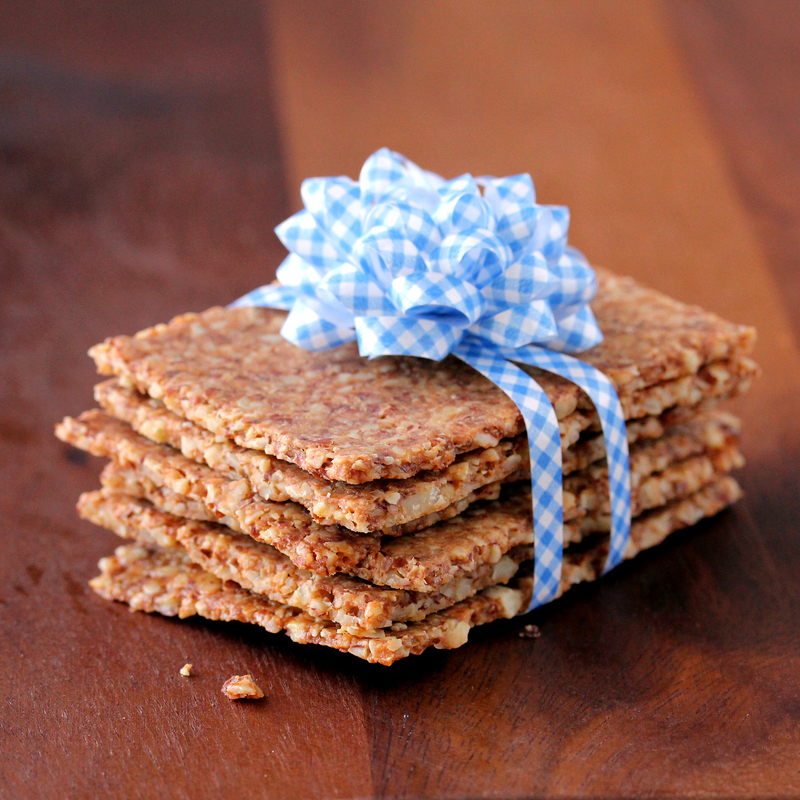 Grain-Free "Whole Grain" Crackers - Low-Carb, So Simple! -- gluten-free, sugar-free recipes with 5 ingredients or less | Low-Carb, So Simple! 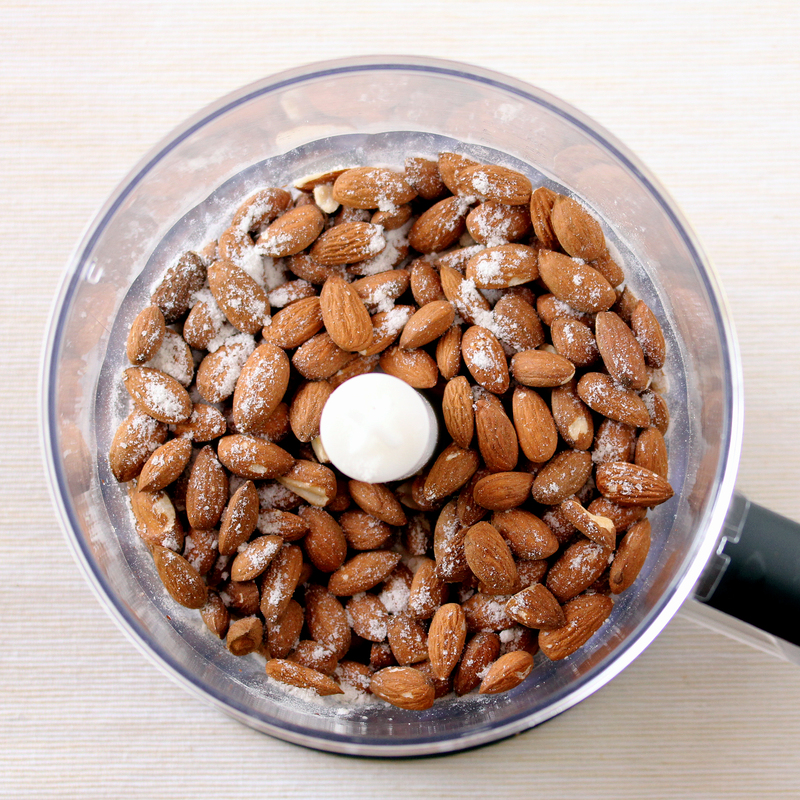 In a food processor, process the almonds and the salt until coarsely ground. The texture should be something between crushed almonds and coarse meal. 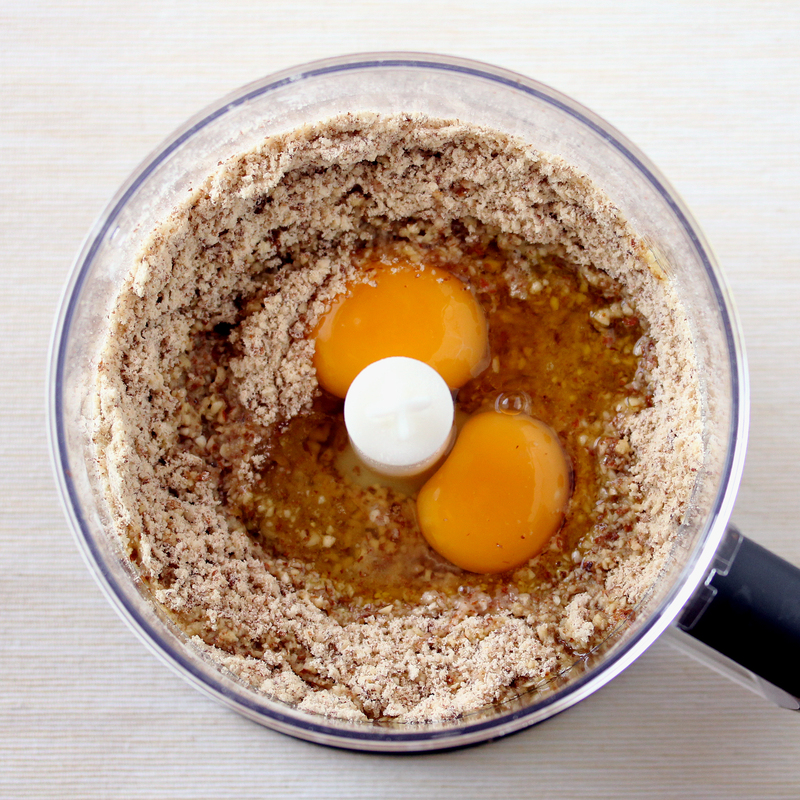 Add the whey protein and mix until smooth. Add the eggs and the oil and mix until smooth. Place the dough on a baking sheet lined with parchment paper and place another parchment paper on the dough. Using a rolling pin, roll out the dough between the two parchment papers as thin as you can. Remove the topmost parchment paper. Cut the dough with a knife or pizza cutter into squares, or into rectangular or triangular shapes. Put in the oven and bake for 50–60 minutes. Remove from the oven, cool completely and break along the pre-cut lines. Store at room temperature to preserve the crunchiness. Use within a few days. The most important thing is to reach the best texture, i.e. coarseness, for the ground almonds. The picture below shows how I like the texture most. There are still tiny chunks of almonds. Well, actually the grind could be still a little finer… I tend to have the problem that I don’t grind the almonds long enough, the pieces are too big which means that they don’t make nice crackers. The texture should be a bit more coarse than in coarse meal. Be sure to roll out the dough thin enough. As thin as you can. That guarantees the best and the crispiest result. In case you feel that the dough doesn’t fit on one baking sheet, you can divide it in two pieces. Keep the second piece covered at room temperature while you are handling and baking the first one. The dough is pretty firm, so you might need to use more power than usual when rolling out the dough. In that case it’s easiest to press the rolling pin from the middle rather than from the handles. Be sure not to roll the edges of the dough thinner than the center. Otherwise the edges might get too brown. These crackers keep well for a few days when stored at room temperature. However, don’t store them longer, the olive oil gets quickly rancid. So it all started from some ideas for crisp bread. Crisp bread and all its variants are really popular here in Finland and actually in all Nordic countries and in Germany, too. The traditional crisp bread contains rye — or nowadays mainly wheat — and that’s why it’s a definite no-no in my lifestyle. Usually crisp bread has brownish color. That gave me the idea of using unblanched almonds rather than blanched almonds. I also wanted to keep the amount of nutrients very high. Traditional crisp bread contains “bubbles”, which are developed by leavening or after some mechanical process. My version, however, doesn’t have any bubbles, since I don’t really miss them. And I didn’t want to use more ingredients or more effort for making this crisp bread or crackers than what is necessary to get the texture I want. My first experiment I did with 2 1/2 cup (360 ml) almonds and 1/2 cup (120 ml) roasted sunflower seeds. I processed them until the seeds and the almonds were crushed, added 1/2 teaspoon salt, 2 eggs and 2 tablespoons olive oil. I spread the dough on a baking sheet with a spoon and baked the whole thing at 300 °F (150 °C) for a half an hour. The bread came out nice, but I wasn’t completely satisfied. The flavor of almonds was a bit too overpowering and the texture wasn’t crunchy enough. The pieces of almonds in the bread were also far too big. In my next experiment I increased the amount of sunflower seeds by 1/4 cup (60 ml) and added 3 tablespoons olive oil. Everything else I did the same than in my previous experiment. Better, but still some space for improvement. Spreading the dough with spoon or hands was quite laborious and it wasn’t easy to make an even surface. I was wondering if rolling out the dough between two baking sheets would help. It did. The surface was nicely even and smooth. Even better, the dough was easy to get thin enough. So far I had broken the ready bread into pieces without pre-cutting it. Then I thought that pre-cutting would make it easier to break the bread into pieces and the pieces would look neater. But I still wasn’t satisfied with the crunchiness — or actually the lack of it. I remembered my previous experiments with Sour Cream and Chive Crackers. I got the best level of crunchiness when the oven temperature was as low as 250 °F (100 °C). It could work also here. Well, it certainly did. After one hour baking the crackers were crispy, crunchy and great. I thought that maybe something else would complement the almonds better than sunflower seeds. Hulled sesame seeds were a nice addition when sprinkled on top, but would they work if added to the dough? I ground 1/2 cup (120 ml) sesame seeds with the almonds and the salt. The resulting crackers had a bit too interesting flavor to my taste. Well, but I’m not that big fan of sesame seeds. For somebody else, that might work. I was thinking of other options and I suddenly figured out that whey protein could help improve the flavor and the texture. 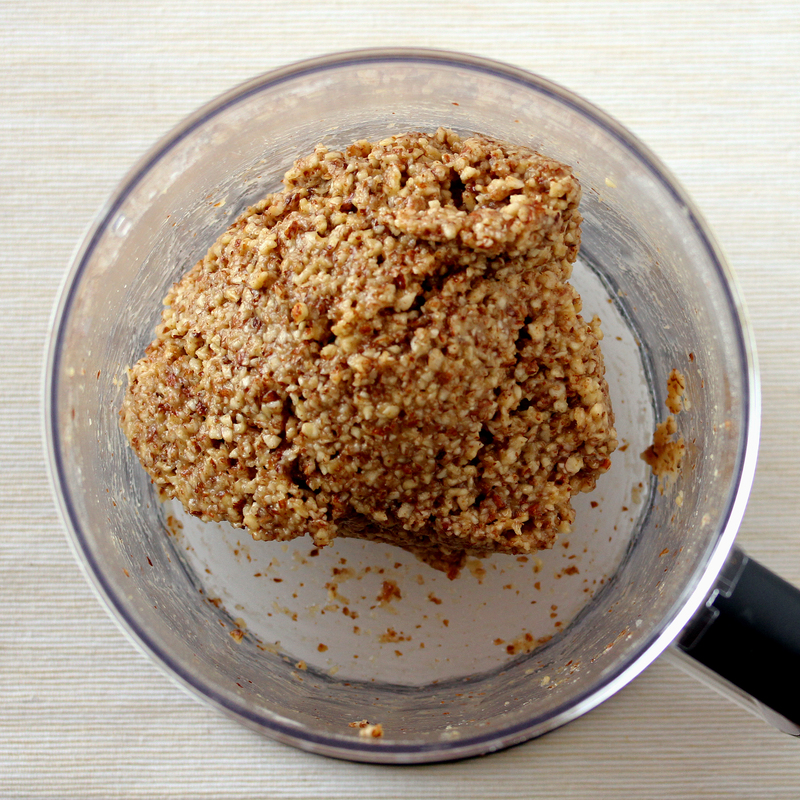 I had used it before when making for example cookies and it helped improve the crunchiness. I wondered whether it would work here. I didn’t dare to add too much whey protein, just 1/4 cup (60 ml), because too much might make the surface too hard and later on slimy. I increased the amount of almonds to 2 cups (480 ml) because I didn’t add other nuts or seeds. Finally I was satisfied, the crackers came out with a perfect taste and a perfect texture! I just realized that I could have tried a dairy-free version by replacing the whey protein with for example hemp or pea protein. Well, maybe next time when I bake these crackers. These crackers don’t basically need any spices, just some salt. However, you can use as much and as many spices as you want. Below some of my personal favorites. Add 1 tablespoon organic caraway seeds and grind them together with the almonds and the salt. Sprinkle sesame seeds on top just before baking. Press the seeds gently to the dough so that they don’t drop off. Try out other seeds as well. Add 1 teaspoon organic garlic bread seasoning. Gives tasty garlicy flavor. Add 1–2 teaspoons dried organic rosemary. 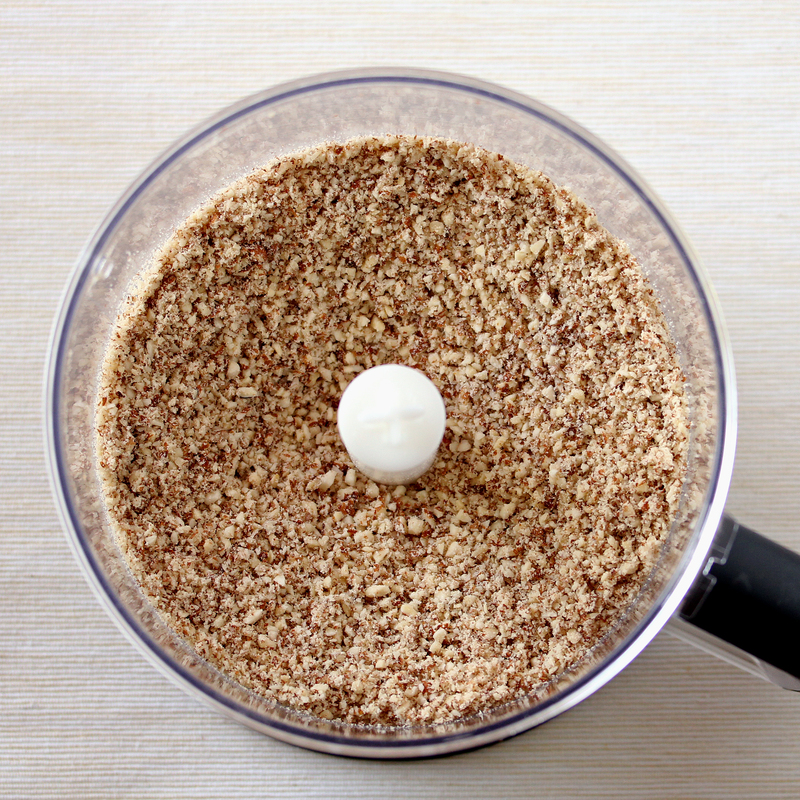 Add the herb simultaneously with the almonds and the salt so that it will be ground and evenly spread in the dough. For extra saltiness: crumble some sea salt flakes (like Maldon or Fleur de Sel) on top, just before putting the dough into oven. Crumble some crackers on top of salads or soups. Use them in place of nachos, especially if you manage to get them very thin. Reduce the amount of salt to 1/4–1/2 teaspoons if you are planning to enjoy the crackers with jam or other sweet spread. GREAT RECIPE!, MAYBE IN THE FUTURE YOU WILL HAVE A CHICKEN IN A BISCUIT KETO – LOW CARB VERSION RECIPE, LOVE THOSE CRACKERS, BUT BAD FOR YOU. So what exactly is this whey stuff you’re using? Will it bother someone who’s lactose intolerant? It also sounds very highly processed; any tips for a less-processed substitute? Thanks. Otherwise the crackers look delicious! Hi Lilah, whey protein is processed, but not very highly processed. It’s the by-product of cheese production, where the leftover whey is processed by drying, or the protein content can be increased by removing lipids and other non-protein materials (from Wikipedia). The whole batch of crackers contains 1 g lactose — which is not much — but if the lactose intolerance is severe, you will get symptoms. I haven’t tried, but usually replacing whey protein with pea or hemp protein works. You might also want to try my other cracker recipe, it’s completely dairy-free and totally without anything processed: http://www.lowcarbsosimple.com/grain-free-crackers-with-olive-oil/. low fat yummy dessert recipes!?!? Low-fat? I don’t know what results the search engines have given you, but I would never ever publish something that unhealthy in my blog. I couldn’t despise more commercial low-fat and fat-free products. I still wonder people fall for those. Yum, they look great. Pinning them! Thanks for your comment, Carolyn! Btw, you have absolutely fantastic blog! I can not wait to make these !! Thanks, Adeline! Tell me how you like them if you try them out!